I remember the first purse I got in like grade seven and I had NOTHING to put in it, so I went around the house looking for cute things to fill it up with, "can of Cream of Chicken Soup? Sure! It'll feel heavy!" Now my purse looks like my mothers full of receipts and tweezers and there is way too much junk in it HA! You know how purses are so sacred to girls, and how when an old boyfriend went to go look in your purse you would slap him away and act all offended "You can't look in there, a girls purse is personal!, don't you know". All for fear of him finding a tampon or heaven forbid a can of Cream of Chicken Soup! 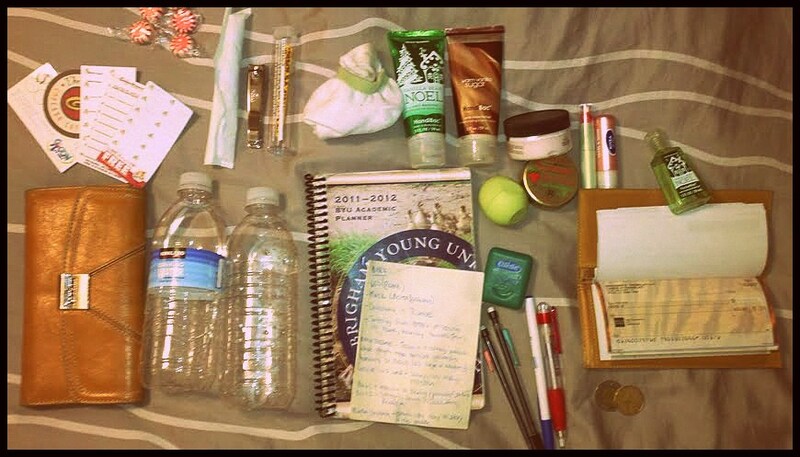 And you know how people say you can tell everything about a girl just by looking at the contents of her purse. Let's see what mine says about me! Canadian Cash-A Toonie (2 dollars) and a Loonie (one dollar)-They are actually called that!!! A very thirsty, dry skinned Canadian girl who pays for her vanilla frozen yogurt with obnoxious checks. Linking up with the lovley Jes and Crystal for "Peep Please" So fun and if you don't link up "you can't sit with us...YOU CANT SIT WITH US!" so glad you linked up!!! i always have just a bad habit with water bottles too. and FLOSS? you are my kind of girl. haha you would NOT want to see the inside of my purse right now. It's dangerous in there! ohhh yes. I think the thing I'm loving most is the water bottle with the swig left. You never know, that swig could be the one you need to save your life. Also, a Loonie?? haha Awesome! I don't even dare show what's in my purse before cleaning it out... ha ha! I swear I have hundreds of loyalty cards! Okkkk. Not that many, but it feels like it! I am in love with anything Hempz. Especially pomegranite. And check books are a sign than you are from simpler times. I have tons of those things laying around my place. And all of them have my maiden name on them still. Does that stop me from using them? No. Haha. I totally remember getting my first purse and putting random stuff in it! I will never have that problem again! So funny!